It’s closer than Tuscany, but the gallery at Via Umbria is a bit of a hike. 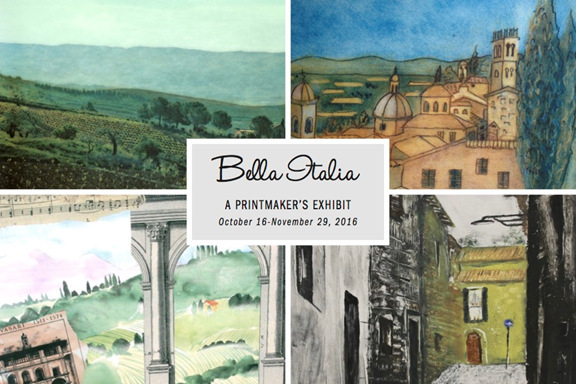 Up the stairs and beyond the test kitchen, the cookery store is hosting “Bella Italia,” featuring four members of the Washington Printmakers Gallery. The emphasis is on landscape, but Rosemary Cooley ventures into history, artistic and otherwise. Nina Muys’s delicate prints depict small Italian towns; the palette is primarily in shades of clay and brick, sometimes set off by green woods or blue lagoons. Deron DeCesare’s prints and drawing are also cityscapes — vertical and with a strong sense of enclosure. Jane Mann’s digitally manipulated photos go for the opposite sensation, portraying fields that might roll forever under misty skies. Cooley’s pieces are the most diverse, and include such Renaissance touches as gold leaf. The technique is classical, and so are such pictorial elements as ornate columns and arches. Yet the artist reveals a modern sensibility in the way she combines styles and subjects in a single picture. If the individual elements are precise, the overall effect is impressionistic.